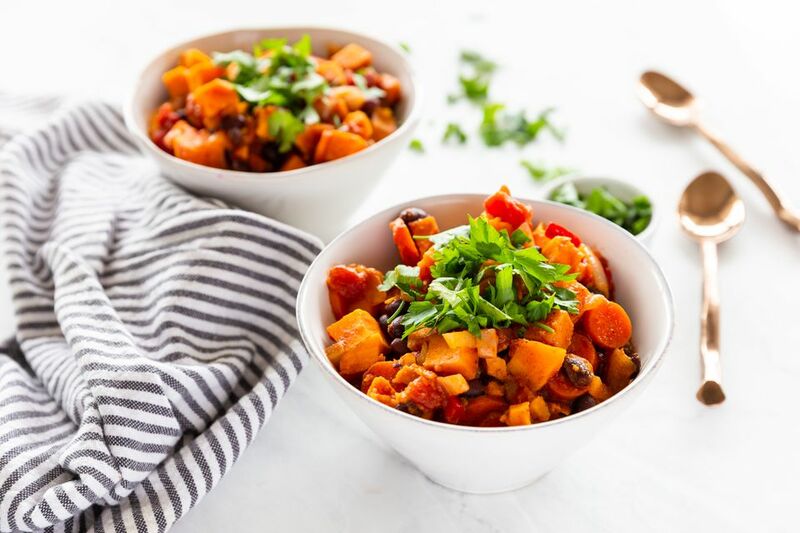 If you're making a vegetarian meal or bringing a dish to a potluck, this black bean and sweet potato chili is so flavorful that it can please anyone. The sweet potatoes and carrots match perfectly with the spiciness of the fresh chili flavor. This dish is an excellent source of protein for anyone, whether vegetarians, vegans, or kids. All of the ingredients in this recipe are both vegetarian and vegan, and, if you use water (instead of vegetable broth), it is gluten-free as well. Some store-bought vegetable broths are gluten-free and some are not. Read the label, if in doubt, or, make your own homemade vegetable broth. In a Dutch oven or soup pot, sauté the onions and garlic in olive oil for a minute or two. Add the chopped sweet potatoes, sliced carrots, and optional chopped bell pepper to the pan and cook until the onions are soft, about 5 to 6 minutes. Allow your chili to simmer, partially covered and stirring occasionally over medium-low heat, for about 20 to 25 minutes, until the flavors have mingled and the sweet potatoes, carrots, and bell peppers are soft. Serve in a bowl topped with your favorite chili toppings and enjoy. Consider a toppings bar for your black bean chili, including salsa, chopped cilantro, sliced green onions, diced avocado, and crushed gluten-free corn tortilla chips. Sour cream, shredded cheese, or vegan substitutes might also be offered (checking labels if gluten-free foods are desired). Store any leftovers in the refrigerator. They should be good for two to four days and will reheat well in the microwave. You can also make a pot of black bean chili and freeze individual portions for later meals. Allow the chili to cool, place it in individual freezer containers, label with the contents and date, and freeze. The chili will be of good quality for up to six months. You can defrost it for six hours or overnight in the refrigerator before reheating. This recipe uses canned black beans for convenience. You can start with dried black beans but you will need to soak them and cook them before adding them to the recipe. If you are using dried black beans, start with a little less than 2 cups. Soak them for at least three hours (or overnight). You can add the soaked beans to the recipe and increase the cooking time to 2.5 to three hours. Or, you can bring the beans to a boil and let them simmer for two hours before adding them to the recipe.